Another excellent service that’s provided by Google is their Google Cloud Print service, which enables any application whether it be a remote mobile device or a desktop computer that’s part of the network cloud, to be able to print documents to any designated online network printer. This without having to maintain or creating printing subsystems for any one of the hardware configurations of existing client devices or printers. There is no need to install any additional drivers in the clients as well. 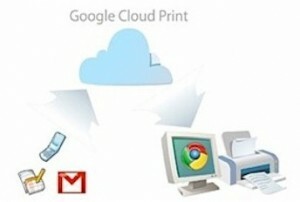 Google’s Cloud Print is designed as a solution for printing documents using Google’s latest version of Chrome. Applications are able to print through an online web based common print dialog, which is usually either web UI or API. The service forwards the print job request directly to the printer that was designated in the network prior to the print activation. There will also be some printers which will be pre-configured to be able to connect directly to Google Cloud Print, while older printers will need to connect through a proxy server. The latest version of Google’s Chrome now contains a “Cloud Print” connector function, where the user can use Google Cloud Print anytime while the connector is running. As Google Cloud Print is now out of beta and fully operational, the use is convenient and easy to operate as originally promised. This new service now makes it completely possible for any Web connected PC user to be able to print wirelessly to any printer on a network. This can be performed from any device that is connected to the Internet, devices such as: smartphones, tablets, netbooks, laptops and remote desktops which are able to support Google services such as Google Docs and Gmail. Google Cloud Print supports a variety of Window platforms including Vista, Windows 7, as well as any of the earlier versions as well. Regardless of the version that your device is using, you will need to install Google’s latest version of their Chrome browser on your PC in order to for Google Cloud Print service to work. The host computer which you’ve installed Google Cloud Print needs to be connected directly to the same network which the printer is that you want the print jobs from. So before moving on, you need to open Google Chrome as well as turning on your printer. What’s also required is a Google account. Once you have Google Chrome installed, open up the browser and then look for the small Wrench icon which is located near the top-right corner of the Google Chrome window. Click on it, and from the pop down menu that will open, select Options. Once the ‘Options’ pane opens, click the tab which is labeled ‘Under the Hood,’ and then scroll down to the bottom of all the available options. Click the button labeled — Sign in to Google Cloud Print. Sign in using the Google Account information from earlier. Once everything is setup, there should then be a new window indicating that everything is operating correctly. Then go ahead and click or tap on the ‘Print’ link. Doing this should open up a new browser window showing the same printer options that’s offered on your home or business networked computer. To print out your Google Docs file, select the printer, set up the print options if required, and then watch as Google Cloud Print prints out your document. Provided that you left your home or office computer which is running the Google Chrome on, the print job that you sent from your remote mobile device should print out. If you or someone else happens to turn off that network hub computer, then all what’s required is you turning that computer back on and opening Chrome. The documents that you wanted printed will automatically be sent to the designated printer and should immediately print out.